Plot: The story of The Darkness that Comes Before is not easily summed up. There are factions both political and religious, and many characters including princes, mages, warriors and a prostitute, all of whom get wrapped up in preparations for a Crusades-like Holy War to capture the holy city of Shimeh. Comparisons between the actual Crusades and the attempt to capture Jerusalem are hard to ignore, although Bakker doesn’t seem to be making any allegorical statements here; rather, he uses history as a reference and blueprint, including mention of the Holy Shriah, who could be compared to the Pope. Meanwhile, there is a “barbarian” named Cnair Urs Skiotha who becomes the last of the Utemot tribe after he is betrayed in battle, who seeks revenge on the man he feels responsible, the father of a mysterious wanderer named Kellhus, who, through powers of psychological observation and a philosophy that “what comes before determines what comes after” (apparently this guy never heard of Jean Paul Sartre), can manipulate people’s thoughts and passions to benefit his own purposes. Pros: Scott Bakker proves himself a master of the English language, writing in a superb, poetic style that is never overbearing or pretentious. His style relies on short sentences and some brilliant uses of metaphor. I found myself enjoying many of his descriptive passages, though infrequent, and his battle scenes are fast-paced and thrilling (I only wished there were more of these). The plot is interesting overall; keeps you guessing and avoids many overused clichés. Cons: I may be a bit prejudiced reviewing this kind of book, since I tend to prefer the more “fantastical” type of fantasy. There were times when I just wished something crazy would happen just to throw me off guard, but The Darkness that Comes Before reads a lot like a pseudo-history. You could easily read whole chapters without finding an inkling of the fantastic. I do enjoy reading history, but when I pick up a fantasy book I expect certain elements of the story to be, well, fantastic. If you are the type of reader that enjoys the more realistic, nearly real-world type fantasy, than this one is for you. I was also a bit annoyed by the pacing of the story. I am a big fan of the media-res technique and use it often in my own writing, but Bakker relies too heavily on this technique. If a plot normally progresses from A to D, Bakker will tell you all about B, while hinting at what happened at A and C, then move onto D while going into greater depth about B. It’s a little disorientating. My biggest gripe, however, is that the entire book seems to happen inside the characters’ heads. The perspective shifts from one person to the next, most of whom we don’t know very well or don’t care much about, and then huge passages become devoted to their thoughts. The dialogue is clever and unpredictable, but I don’t need a commentary on every single line spoken. It’s almost like watching a movie for the first time with the audio-commentary on. Sometimes I just wanted to read the dialogue and make my own assumptions. This is one of those books that serves as a setup for a sequel. But a story should stand on its own merits, I think, so I was a bit disappointed to find myself with too many unanswered questions. 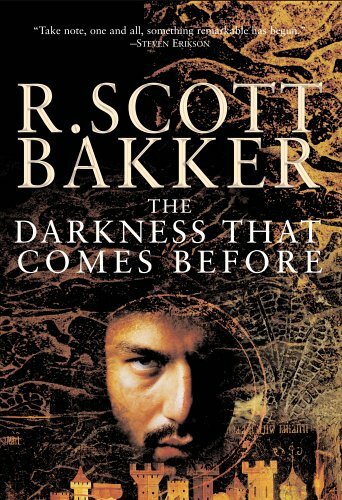 Overall, this was an accomplished debut novel by newcomer Scott Bakker and I think the author has a lot to offer the genre.